The pink hat became a vibrant symbol of women's rights in January 2017 when about five million people around the world participated in the Women's March. A year later, Andrew Joyner celebrates that day with subtlety and joy in this stunning picture book. Understated and clever, this story is not necessarily about the march. Rather, it is a gentle reflection of some of the obstacles faced by women, along with the global shift that saw people from all walks of life unite in solidarity. It starts with a different generation — an older lady knits the hat, snaps a selfie while wearing it on her head and then uses it to warm her feet. But then a cat grabs the hat (am I the only one who sees a Donald Trump reference here? ), and then some children find it, a baby catches it and a dog swipes it. Until, at last, a young girl saves the hat. She uses it in a range of bold and creative ways, before wearing it to join a throng of people marching for women's rights. 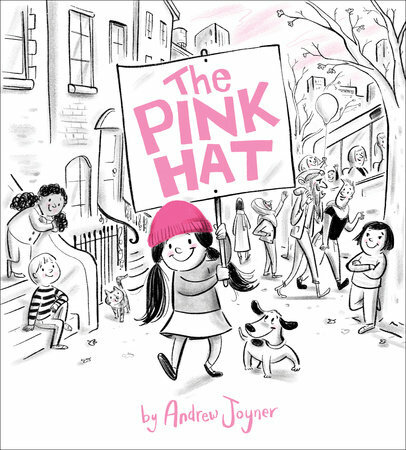 Andrew's striking black-and-white line illustrations capture so much detail and delight, highlighting the hat through pops of bright pink that appear as the only colour on each page. Rich with diversity and brimming with hope, the book is peppered with beautiful details, from the picture of the young girl in the older woman's home, to the young boy boosting a girl into a tree to reach the hat, and finally the older lady who knitted the hat watching the march with pride from her window. This is a wonderful way to start a variety of conversations about women's rights and that memorable day.